Scientists first discovered cannabigerol, or CBG, in 1964 as a constituent of hashish. In 1975, researchers found out CBGA (Cannabigerolic Acid) is the first cannabinoid formed in the plant; the first expression of cannabis’ unique class of cannabinoids. From there, CBGA gets transformed into THCA, CBDA or CBCA by the action of enzymes. The ability to produce cannabigerolic acid (CBGA) is what makes the so cannabis plant unique. Cannabigerol (CBG) is like a mother, the precursor to the three major branches of cannabinoids: tetrahydrocannabinolic acid (THCA), cannabidiolic acid (CBDA), and cannabichromenic acid (CBCA). The plant has natural enzymes, called synthases, that break the CBGA down and mold it toward the desired branch. The plant’s synthases (THC-synthase, CBD-synthase, CBC-synthase) are named for after the cannabinoid they help create. Cannabigerol (CBG) is a non-psychoactive cannabinoid which is currently being investigated for a multitude of medical properties. While it is not as well studied as THC or CBD, research finding so far suggests it does have a wide range of medical benefits for the cannabis consumer. When any of the cannabinoid acids are exposed to heat or prolonged UV light, they lose a molecule of carbon dioxide (CO2). At this point, they are considered to be in the neutral cannabinoid form of CBG, THC, CBD, CBC, & etc. In most cannabis strains, CBGA is immediately converted to another cannabinoid and is not typically found in high concentrations. However, if a strain is high in CBGA, then smoking it would cause it to change to cannabigerol (CBG). Testing of industrial hemp strains has found much higher levels of CBG than most strains of cannabis. Further studies have shown that this phenomenon may be due to a recessive gene. It is believed that the gene keeps the plant from producing one of the cannabinoid synthases (what converts CBGA to one of the major branches). CBG is effective in a range of treatment and therapies, according to a report by Ethan B Russo, published in the British Journal of Pharmacology. These include producing modest antifungal effects, inhibiting keratinocyte proliferation which may be useful in treatment of autoimmune diseases, in conjunction with l-limonene (citrus terpene found in cannabis)- CBG shows promising results to fight many kinds of cancer, and pure CBG and CBD cannabinoids can powerfully inhibit MRSA. Just recently in January 2015, researchers discovered that CBG had neuroprotective effects in mice with Huntington’s Disease, a disease characterized by the degeneration of nerve cells in the brain. CBG has also shown it slows down the progression of colon cancer in mice, a promising result that may soon lead to a new treatment method. Evidence suggests CBG is a highly potent alpha-2-adrenoceptor agonist and moderately potent 5-HT1A-receptor antagonist, giving it a wide range of potential therapeutic potential use as an antidepressant, for dermatological applications, and as an analgesic. CBG has been classified as an antagonist of the CB1-receptor in the endocannabinoid system, which affects the central nervous system. Cannabigerol has also been determined to affect the CB2-receptor, which influences the entire body more. However, researchers aren’t sure if CBG promotes or inhibits CB2-receptor activity yet. An Italian study published in May of 2013 suggests that CBG’s strong anti-inflammatory properties can benefit people with inflammatory bowel disease (IBD). In this study, CBG was found to normalise a range of inflammatory markers, reduce oxidative damage-causing free radicals in the human body and raise levels of one of the body’s own antioxidants- superoxide dismutase. Superoxide dismutase is a metal-containing antioxidant enzyme that reduces potentially harmful free radicals of oxygen formed during normal metabolic cell processes to oxygen and hydrogen peroxide with in the human body. Free radicals can damage any component of the body’s tissues, from connective tissue proteins to DNA, which can cause more inflammation, and inflammation is the body’s response to damage. CBG also is useful in the treatment of glaucoma, as it can increase the fluid drainage from the eye and reduce the amount of pressure. It has also been shown to stimulate the growth of new brain cells, including in the elderly; it should be noted that genuinely neurogenic compounds are extremely rare. CBG also stimulates bone growth, is antibacterial, and combats insomnia. One of the most recent studies on CBG shows how it can help those who suffer from extreme weight loss caused by a host of debilitating ailments. This has recently sparked the interest of the scientific and medical community in CBG as a safe and effective means of stimulating appetite, according to research conducted at Berkshire’s University of Reading that was recently published by the U.S. National Institute of Health. 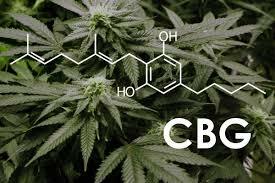 CBG as a minor cannabinoid is in pretty much all varieties of cannabis, generally at less than 1%. Nevertheless, narrow-leafed cannabis strains from the Indian-subcontinent, were found to have slightly higher levels of CBG than others. If you live a state that allows you to legally grow cannabis, relatively high amounts of CBG can be extracted from cannabis plants about three-quarters of the way through flowering. Information on CBG content throughout flowering can be gathered from an analysis done on Bediol, a medicinal strain produced by Bedrocan BV Medicinal Cannabis, a Dutch supplier of research grade medical cannabis. They flowered the Bediol for eight weeks and analyzed the content of different cannabinoids every week finding that CBG was the highest at week 6 during the flowering stage. As cannabis consumers continue to show more interest into the diversity of cannabinoids like CBG, growers in the industry will follow suite and further be able to create CBD-CBG hybrid strains. This will introduce a whole new possibility into the future for the medical uses of cannabis and it’s variety of strains. Medicinal strains that are high in cannabigerol are likely to have a much more balanced effect with the body’s homeostasis. CBG seems to help your brain find a happy medium between the rest of the cannabinoids, causing a therapeutic feeling of synergy. Once more one of cannabis’ lesser-known cannabinoids has received scientific vindication and a clean bill of health. With scientific findings showing CBG to work synergistically with CBDA and THC, the CBG compound has many beneficial attributes for the cannabis consumer without some of the nastier side effects of the western world’s toxic pharmaceuticals.